Unless otherwise stated, metallic paint at extra cost. Library image shown for illustration purposes only. 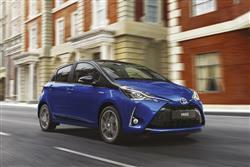 Hybrid technology features in every Toyota Yaris trim level and a recent package of improvements has made this petrol/electric supermini model smarter, plusher inside, better to drive and quieter. Oh and did we mention it still can record over 85mpg? 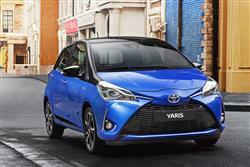 Petrol electric technology has worked well for the Toyota Yaris and the result is that hybrid variants accunt for an increasingly large proportion of total Yaris sales. 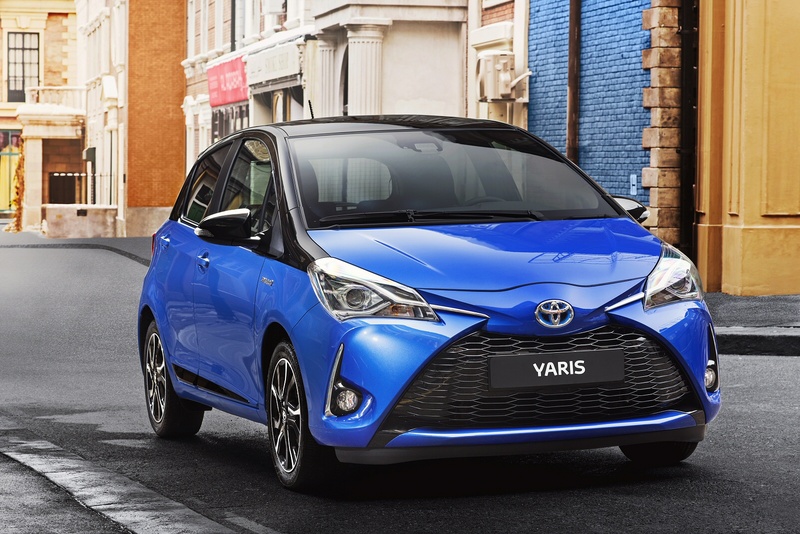 It's also helped that this model has been refreshed in recent times as part of a general Yaris range update that incuded 1,000 new parts and saw 576,000 man hours of development. Though this wasn't the market's very first hybrid supermini, it was the first able to improve upon the running costs of comparable eco-conscious diesel models in this segment, while matching (or beating) them on price. Which has made this model a game-changer in its town-targeted market sector and, in theory at least, an impossible option to ignore for those who spend much of their lives in the kind of stop-start traffic where hybrid technology really comes into its own. Let's put it to the test. 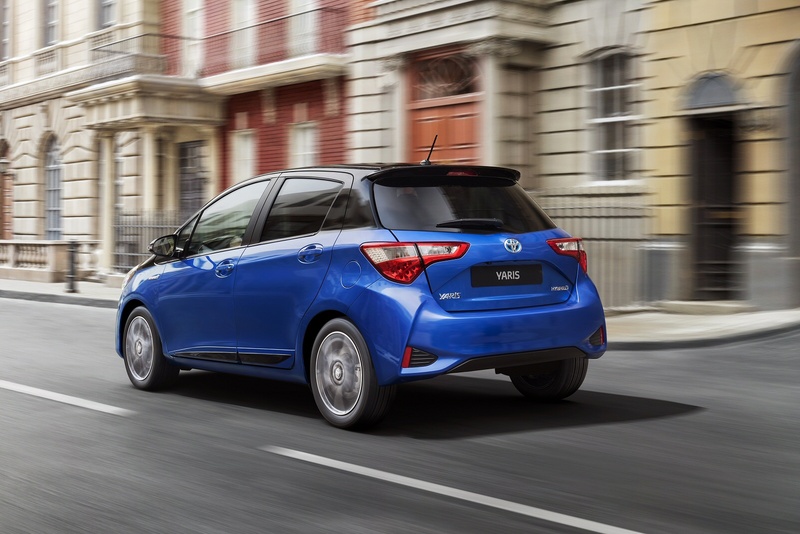 The Yaris Hybrid is powered by a combination of a 1.5-litre petrol engine and a small electric motor which together combine to produce a modest 100PS. That might not sound much, but such is the torque of the motor that it feels as if it's got the lazy flexibility of a bigger engine which is exactly what you want around town. You can pull away and drive just over a mile purely in electric mode if you're light on the throttle and when the petrol engine does kick in, it's anything but uncouth. Drive goes to the front wheels via an e-CVT continuously variable transmission and the turning circle is, at 4.7 metres, just as tight as the regular Yaris. The power pack is effectively a downsized version of that featured in the Prius, with a more compact electric motor, transaxle, inverter and battery pack. With this revised model, the engineers have tweaked things quite a lot, adding in a new subframe, as well as changing the engine mounts and front driveshafts and adding in a roll restrictor. All of this is claimed to make the car even quieter and smoother, particularly under acceleration. As before, this model is at its best in stop and start city traffic. Ride quality retains a decent suppleness, courtesy of a supple torsion beam rear suspension. The steering is also sharper than you might expect. Toyota has spent over 90 million Euros improving this model, so we're talking about more than just a light facelift here. The front end is completely new, much sleeker and classier than before. There are revised rear tail light clusters too. It's these days a more assertive-looking design and Europeans like that. The headlights feature projector technology for high and low beams and the clusters incorporate LED daytime running lights. 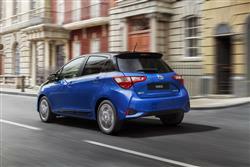 In profile, this improved Yaris displays a smart door belt moulding, door mirrors with an optional folding function and classy 15 and 16-inch alloy wheel designs. A rear bumper and diffuser assembly give the back end a more self-confident look. The interior features the Toyota Touch 2 multimedia system, complete with a 7-inch screen. 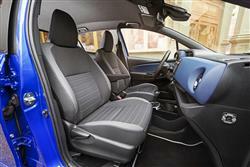 This apart, the interior hasn't changed much since this car was launched in 2011. Which means that build quality from the French Pas-de-Calais factory is as strong as ever. And that the controls are sensibly positioned and extremely easy to get to grips with. There's also plenty of interior storage space, though some of the ledges provided tend to deposit their contents onto you once you corner with any speed. The door bins are useful though, able to accommodate a decent sized drinks bottle with ease. By cleverly packaging the hybrid drive system, this Yaris features just as much boot space as its more conventionally powered siblings. That means you get 272-litres under the parcel shelf and when you drop the 60:40 folding EasyFlat rear seats you've got up to 477-litres at your disposal. 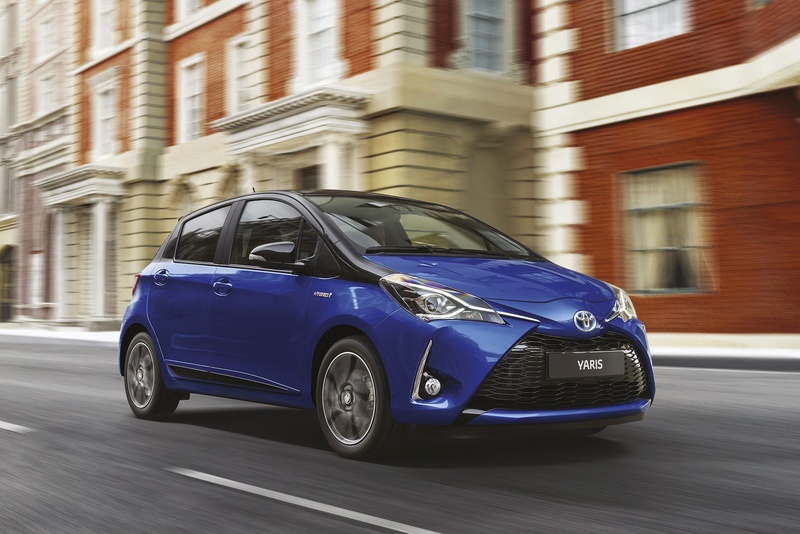 Originally, it was only possible to order a Yaris Hybrid with very plush trim, but you can now specify this technology right across the range, which means a lower starting point for prices which begin at around £16,000. 'Active' is the entry point to the five-door-only line-up, but even at this level, the car comes equipped with dual-zone climate control, trip computer, power front windows and a split-folding rear seats. The plusher Sport variant cuts a sharper dash with rear privacy glass, 16-inch alloy wheels, rear spoiler and a rear pillar treatment that creates a floating roof effect. Other key features include climate control, power windows all round and the Toyota Touch 2 multimedia system with DAB radio, Bluetooth, touchscreen control and rear view camera. An optional Skyview panoramic roof can also be specified. Further up the range lie 'Icon', 'Icon Tech', 'Design', 'Bi-Tone' and 'Excel' derivatives. The range-topping 'Excel' gets features like part leather seats, cruise control, rain-sensing wipers and dusk-sensing headlights. The Toyota Touch 2 system is interesting, offering an updated take on the touch screen multimedia system with a higher resolution seven-inch display. The package includes Bluetooth for hands-free calling, sending and receipt of text messages and audio streaming. There's a rear-view camera, vehicle information, including trip data, climate control profile and management of settings for door locking and lighting. It comes with DAB digital radio as standard, with an FM link that automatically switches the system to FM reception when there is no DAB signal. Toyota Touch 2 is also MirrorLink-ready, allowing users to connect compatible smartphones and operate them entirely using the touch screen. Toyota Touch 2 with Go is available as an option, adding navigation, connected services and access to a range of applications, including Toyota Real Time Traffic and services such as fuel prices, weather and parking information. The question many will need answered is whether the Yaris Hybrid works out cheaper to run over a three year period than, say, a rival small diesel supermini. In truth there's extremely little in it. 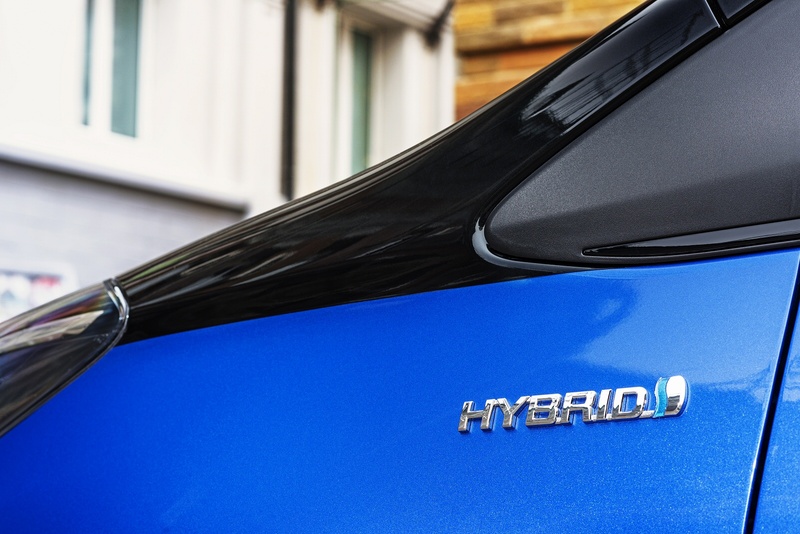 The Hybrid scores better for fuel economy, insurance costs and emissions, but a diesel alternative might counter with slightly better residual values and cheaper servicing. With ever stricter emissions-based tax legislation, the 79g/km Hybrid future-proofs itself better than any diesel - which could be critical. The other thing to bear in mind is that you're building the additional cost of a CVT transmission into calculations on the Hybrid whereas diesel rivals often just campaign with a manual 'box. On balance, we'd say that the hybrid option probably just squeaks it. All told, it's hard to argue with a car that can return 85.6mpg on the combined cycle. If you�re looking for a new Toyota Yaris 1.5 Hybrid Excel 5dr CVT [Pan Roof] Hybrid Hatchback for sale, you�ve come to the right place. At Bristol Street Motors we don�t just have the best Toyota Yaris 1.5 Hybrid Excel 5dr CVT [Pan Roof] Hybrid Hatchback deals, we also offer friendly advice and help with all your enquiries to ensure your buying experience is a happy experience.